Alexander Kerfoot scored his first NHL goal with some part of his lower leg. Doesn't really matter which part - a first goal is a first goal and it's a "great feeling," he said. 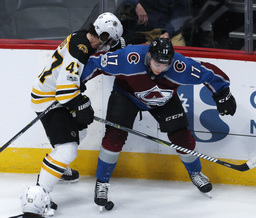 Kerfoot's goal and two more by Sven Andrighetto, the second an empty-netter with 1:34 remaining, helped the Colorado Avalanche to a 6-3 victory over the Boston Bruins in their home opener Wednesday night. "Fun game," Avalanche coach Jared Bednar said. "I know our players had fun playing it. The crowd was fantastic." "It was just a dangerous play," Bednar said. "Fortunately, he's not hurt. To see him bounce back, our guys are pretty excited to see him come back out there." "We didn't get anything going. We woke up a little too late, when it was 4-1," Rask said. "Very tough game." "They were better than us again, the second time in three days," he said. "To get a goal is pretty special," Kerfoot said. Duchene set up Kerfoot's goal with a feed out front to Barrie. Duchene has two goals and three assists this season as he tries to keep his focus on the ice with his name being mentioned in trade talks since last season. "Same message I've preached all camp and all season so far - I'm just here to be the best I can be for this team," Duchene said after the morning skate. "I haven't thought about Matt's situation, his circumstances, whatever you want to call it, since we opened training camp, to be honest," Bednar said. "He's anchoring that line with Kerfoot and Yakupov, and they're good every night. As long as they stay competitive and keep working like that, that's all I care about." NOTES: C Patrice Bergeron missed a third straight game with a lower-body injury. Bergeron's next one will be his 900th game with the Bruins. ... RW David Backes remains out with diverticulitis. ... Avalanche forward Nathan MacKinnon had two assists in the second period.